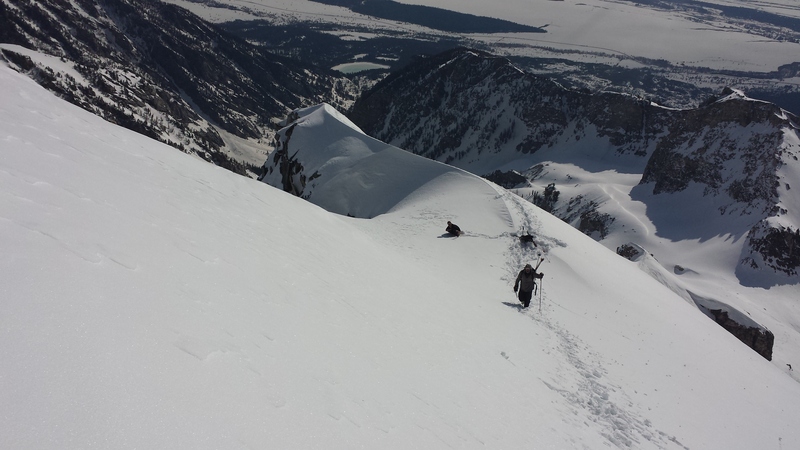 Today we skied the East Face of Buck Mountain in Grand Teton National Park. 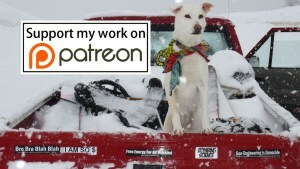 Yesterday afternoon a Facebook posting alerted me that Buck had been skied successfully that morning, and two minutes later my friend Bartleby invited me on a trip he and Ski School Bill were planning. I felt the stars aligning and happily agreed to tag along. Ascending Stewart’s Draw to ~11,000ft the snow was firm and unbreakable. From there to the summit we found variable breakable crust on 3-5″ of soft snow and debris from the previous day’s wet slides. Many of the wet slides appeared to have been skier triggered. Fortunately temps had gotten cold enough overnight and we were early enough that we had no worries about triggering additional wet slides on the mountain’s upper flanks. Someone had put an exhilarating bootpack up the East Ridge so we followed that instead of booting straight up the East Face. The bootpack was pretty deep and appeared to have been last traveled in wet conditions. The last traveler before us had left detailed bootprints which had not been sun affected at all, indicating that the last party prior to us had made their ascent pretty late the day before. It appeared that several parties — at least 10 people total — had skied Buck on 4.20. Skiing from the summit was variable and sketchy: breakable sun crust on 3-5″ of soft snow with lots of debris from previous skier traffic and wet slides. After traversing skier’s left between the cliffbands, skiing became much better and from ~11,000ft to the valley floor we found smooth, supporting, creamy corn. Down low the snow is getting pretty shallow and many tree wells are totally bare. I was grateful that we made good time — back to the car by 10:45 am — so I wasn’t sinking my skinny skis into the slush that often forms when shallow snowpack thaws through on the Tetons’ lower flanks. This was my first attempt to ski a big peak on my little skis and it went well. Ascending with such light and maneuverable skis was ideal. The descent was manageable in the sketchy upper portions and extremely enjoyable for the other 4,500vert back down to the floor. It felt like a supergroomer and those little skis carve surprisingly well. A lot of tracks visible from Buck indicated that people have been skiing powder on shady aspects above ~9,500′. Even the East Ridge of Buck had soft, powdery, not-too-wind-affected snow hiding on it’s N facing aspects. With more snow in the forecast we could be in for a bonafied powder day in the near future. All in all it was a great day on a great peak with two great guys.